Concert Properties, which has evolved over its 27-history from a residential developer to a diversified real estate owner and operator, this month announced the completion of its CREC Commercial Fund LP. The $1-billion-plus, open-ended limited partnership fund currently consists of 60 properties across Canada that total over 7.6 million square feet, with the intention to further expand the platform. Vancouver-based Concert has sold 40% of the fund’s portfolio to investors and retained the majority share of the assets, which are a mix of industrial and office properties in British Columbia, Ontario and Alberta. “The intent is to hold the portfolio and to build the portfolio long term, both by building and by acquiring existing” properties, said David Podmore, Concert’s chairman and chief executive. Approximately 85% of the $1-billion office and industrial portfolio was acquired by Concert over the past 18 years and have been upgraded and renovated over that span with the remainder new build. The real estate company has decided that any new office and industrial acquisitions and development will be tucked into the CREC Commercial Fund. 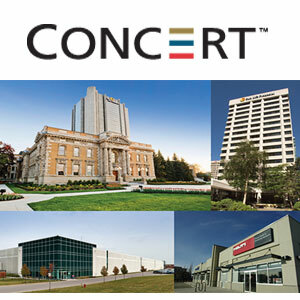 Concert’s traditional roots – development of multi-family residential rental and condominium product for sale and seniors living communities – will be done under the Concert Real Estate Corporation side of the business. “We are not going to be in competition with the fund,” explained Podmore. Concert’s project pipeline includes approximately 1800 units of multi-residential development and another 5500 condominium units across the country. So why are pension funds buying into Concert rather than building up their own portfolios? To date, Concert has built three Tapestry Retirement Communities independent living complexes, an area of growth for the company. “We got involved 10 years ago because my theory is that we needed to get involved early because the real peak in demand still hasn’t arrived, it will be five to 10 years out,” explained the Concert CEO. The company is currently working on five sites that it expects to develop into Trapestry communities over the next five to seven years in the GTA and in B.C.’s lower mainland and in Victoria. “So that portfolio is going to grow quite substantially. On the multi-res side of its business, Concert has built about 5,250 market rental units over its history, and continues to focus on growing that portfolio. One major condo development currently underway for Concert is 88 Scott Street in Toronto, a 58-storey tower near the Fairmont Royal York Hotel. That project features ground-level retail, four storeys of office and the remainder residential with about 94% pre-sold. Going forward, Podmore sees a slate of condo and multi-res development that will keep the company busy for the next seven to 10 years. “We will continue to really focus on building on rental, residential and condominium and then of course we want to build up this seniors portfolio now. So there will be a real emphasis in the (Concert) Real Estate Corp. to build out the seniors portfolio. Podmore noted that it employs partnerships for much of its development. With two of its three seniors properties, it partnered with Sun Life and Oxford Properties. The biggest three-way development today is Village Gate West in Etobicoke, Ont., a project that included three rental towers and a Tapestry retirement community. A growing segment of Concert’s business is the building of “infrastructure” – think government buildings such as schools and police stations. Concert has built 21 schools in Alberta, it is building 18 schools in Saskatchewan, and it has built 18 Ontario Provincial Police regional headquarters. As well, Concert has a concession for management of the Forensic Services and Coroner’s Complex (FSCC) building in Toronto. The FSCC is one of the world’s largest medico-legal facilities at approximately 663,000 square feet and brings together the Office of the Chief Coroner, the Ontario Forensic Pathology Service, the Centre of Forensic Sciences, Office of the Fire Marshall and Emergency Management Ontario on one site making collaboration between the units much easier. Concert likes the infrastructure operating model, explained Podmore. “We technically don’t take ownership, but we are responsible to build them and then we are responsible to maintain them for the 30-year concession and at the end of the concession the properties are turned back to the government.